After I read my first Judy Blume book ‘Are you there, God? It’s Me, Margaret’, I thought I will get other Judy Blume books which are similar and read them. I discovered that she had written around eleven books for older children (early and late teenagers) which covered interesting topics. I wanted to read all of them 🙂 So I went and got seven of them from the bookstore. I read five of them in the past couple of weeks. Here is what I think. This book is about a boy called Tony, who lives in a small town, and whose father is an electrician trying to take care of his family and make ends meet and whose brother is a teacher. His brother’s wife is also studying to become a teacher to support their family. She suddenly becomes pregnant. Tony’s father starts working hard in his basement and invents a new product. He sells it to a big corporation in New York and moves his family to New York to a luxurious house. Tony is not sure whether he will like it, because he has always been a smalltown boy. After moving to the new house, Tony makes new friends who are rich, but they have their own flaws and interesting eccentricities. He misses his old smalltown friends for a while, but he moves on after a while. I found ‘Then Again, Maybe I won’t’ an interesting book on growing up, from a boy’s perspective. (Thanks to Kelly from KellyVision and Mrs.B from The Literary Stew for recommending it :)) It is also about what happens when a poor family becomes rich overnight – what are the consequences of it at home and what kind of pleasant and unpleasant transformations happen. The whole of our modern civilization is based on working towards a better income and a better lifestyle and sometimes we don’t realize the kind of sacrifices we make for that and the beautiful things that we lose because they slip between the cracks of the transformation and sometimes we don’t even realize that we have lost them. In this story, some of the interesting changes that happen are that Tony’s mom becomes a ‘high-society’ mom after they move to New York – she goes out for shopping, gets a cook to work at home, wants her kids to hangout with rich kids, wants her husband to get a better car, wants Tony to learn the piano – and Tony resents this most of the time. Tony’s brother, who is a teacher, leaves his dream job of teaching in a school and joins his dad’s company, because the pay there is more and so his family’s financial future will be better as a result. How many times have we seen people give up their dream jobs or their dream lives, because something else offers more money? How many times have we done something like this ourselves? Tony feels sad when this happens. I felt sad too. Another interesting change that the story describes is that Tony’s grandma who always managed the kitchen at home and made delicious food, is ejected out of the kitchen after a new cook is hired at home. She resents it deeply and sticks to her room and refuses to come out even for dinner. Of course, there are lots of nice things that are also depicted in the story because of the change in the financial status of the family – Tony gets new friends who are sophisticated and rich, he gets a new bicycle which is really cool and he gets pocket money to spend on things that he likes. I liked ‘Then Again, Maybe I Won’t’ very much. I was quite impressed by the way Judy Blume described the life of a boy while growing up, as accurately as she had described the life of a girl in ‘Are You There, God? It’s Me, Margaret’. Three cheers to her. I wish I had read this book when I was in school. I think I would have loved it. When I’m playing basketball I don’t think of anything else. Not Lisa or school work or my family. I concentrate on the ball and getting it into the basket. Basketball makes me feel good. I wish we didn’t have two teams. I wish I could be in there all the time. ‘Not yet,’ my mother said, putting an arm around my shoulder. I knew what was coming. Piano lessons for me. Sometimes I wish we didn’t have so much money. How can I tell them I don’t want piano lessons? How can I tell them I can’t even clap my hands in time to music. I don’t even sing in the shower – I’m that bad! ‘Kids are pretty expensive. Especially when you want to give them everything.’ Ralph and Angie gave each other a secret smile. I thought, maybe that’s the trouble. Maybe kids don’t always want you to give them everything. ‘Blubber’ is about Jill and her life at school. Jill is part of a gang of friends in school, which has the star of the class, Wendy, in it. Wendy keeps bullying the weaker and shy students in the class and Jill along with the rest of the gang join in that. The girl who is bullied most of the time is Linda, who is pudgy. But, once, Jill does the unthinkable – she defies Wendy and she tries to be fair to Linda. Jill pays the price for her defiance. She discovers that she has been ejected out of the ‘in-group’ overnight and has become an outcast, while Linda is part of Wendy’s closest circle now. Now everyone in the class bullies Jill. Luckily Jill gets support from Tracy who is her best friend in school, and she manages to tide over this crisis. 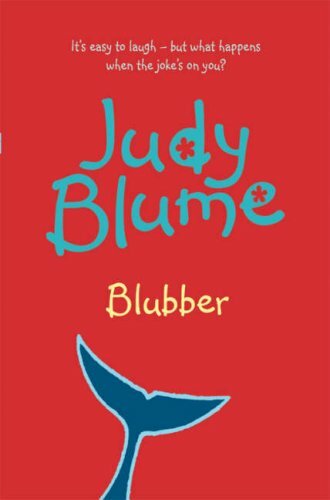 ‘Blubber’ is an interesting book because it is about bullying and anyone who has been bullied in school, because they were pudgy, or they had buck teeth or they were wearing spectacles or their eyes looked different or their dress sense wasn’t considered fashionable or they were from a different ethnicity or spoke a different language at home or practised a different religion, will be able to identify with this book. But for some reason, I didn’t like the book. Looking at it from a neutral perspective, I think Judy Blume does quite a wonderful job in depicting how things are at school and focussing on the bullying aspect of life in school. So, I was surprised that I didn’t like the book much – most probably because I didn’t like most of the characters in the book. Even the heroine and narrator, Jill, is a bully and keeps taunting the less fortunate in her class, till she gets a taste of her own medicine. The only character who was nice was Tracy, Jill’s best friend. My strange reaction to the book, made me ponder on the reasons behind why we like a particular book. Is it because we like the story? Or is it because we like the characters? Or is it because we like the author’s prose? Or is it because we like the realistic way in which the author has depicted the scenes in the story? Or is it because we could see ourselves in one of the characters in the story? I remember reading in a book called ‘The Story of Art’ by E.H.Gombrich about the Renaissance painter Albrecht Dürer’s painting of his mother. You can find this painting here – Portrait of the artist’s mother at the age of 63. The painting shows his mother in old age with lots of wrinkles – ‘it is a tender and unflinching study’ as Wikipedia puts it. Gombrich while talking about this painting, asks the question – what is regarded as beautiful in art? Should the subject of a painting be beautiful or should the painter’s skill be wonderful? It is an interesting question. Most of us respond to the beauty of the subject and unfortunately the painter’s genius gets relegated to the background. Many of us who are not art connoisseurs but are general art fans, wouldn’t look at the portrait of Albrecht Dürer’s mother a second time, but we will keep gazing and admiring Dürer’s another painting ‘Young Hare’, or Giovanni Sassoferrato’s ‘Madonna and Child’. I keep wondering why this is so. After pondering on this for quite a while, I feel that we initially respond to the subject of a painting and it determines whether we like a painting or not. But later, after experiencing art for a while, we learn to respond to the painter’s genius, and the beauty or otherwise of the subject of a painting gets relegated to the background, and we immerse ourselves into the soul of the painting and are able to respond to the painter’s vision. Some people are able to do it from their first instance of experiencing art. So, I don’t know whether this is a natural skill or something which is acquired by experience, though to me, this is something which has happened over the years by experience. When I thought about my response to ‘Blubber’, I remembered Gombrich’s discussion on Dürer’s painting of his mother. What do you think about this? Do you think you respond to the beauty or elegance of the subject in a work or art or do you respond to the artist’s vision? Do you respond to the goodness or otherwise of characters in a book or do you respond to the vision and prose of the writer? Karen has a brother and a younger sister. Her parents frequently keep quarrelling. One evening her dad walks out of home and doesn’t come back the whole night. Then strange things start happening at home. Karen discovers that her parents are separating. She tries different ways of getting them back and making them like each other again. But, unfortunately, every attempt of hers, fails. Her dad moves to a new apartment and introduces Karen to one of his neighbours. This neighbour is divorced from her husband and has a daughter called Val. Karen and Val become friends and Val shares her knowledge and experience on what it means to be the child of a single mom. Karen gradually realizes that despite her best intentions and actions her parents are not going to get back together. She also realizes that her parents love her but they don’t love each other any more. That’s what people say when they can’t explain something to you. I don’t believe it. I can understand anything they can understand. ‘Just As Long As We’re Together’ also tackles separation and divorce. It is told from the point of view of Stephanie. Stephanie’s best friend is Rachel. Rachel is tall, beautiful and is a perfectionist – she excels in music, debate and in academics. Then at the start of a new academic year, Stephanie becomes friends with a new neighbour called Alison, who also joins the school in which Stephanie is studying in. Alison is the adopted child of a famous actress called Gena. Rachel reluctantly accepts the arrival of Alison, but it leads to a few sparks and tense moments among the three friends. Stephanie’s father travels on business quite often and Stephanie notices that recently he is away most of the time. When he comes back home during festival times, Stephanie’s father takes her and her brother out for dinner, while her mother keeps away. Stephanie doesn’t think too much about it until she discovers by accident that her parents are not getting along well with each other and are undergoing a trial separation. She is shocked when she learns that. She also hides it from her friends. How Stephanie learns to accept reality and how she comes out of her shell and talks about it with her friends and how her friends react to it form the rest of the story. While telling Stephanie’s story, the book also talks about the growing up of the three friends, about what they think about boys, about the issues that Rachel and Alison have to deal with, about Alison’s own reaction when her mom becomes pregnant and the secrets that the three friends hide from each other. I loved ‘Just As Long As We’re Together’. 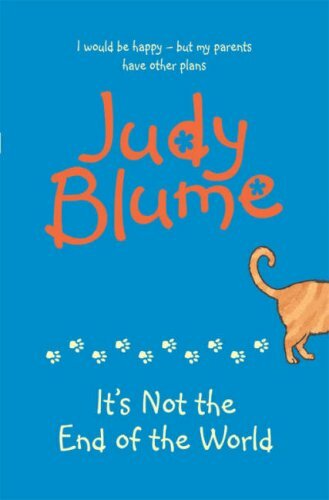 I think it is one of my favourite Judy Blume books till now. The way Blume constructs the story like an artist and the lovely scenes which make up the story, delighted me very much. It deals with the same theme as ‘It’s Not the End of the World’ but it is difficult to compare them because these two stories are told so differently. I liked both of them, but I found ‘Just As Long As We’re Together’ a little bit more interesting, a little bit more complex, a little bit more sophisticated (check the ‘walking’ scene below). The development of characters is perfect, I liked most of the characters in the story and the scenes which take the reader through the story are beautifully constructed, elegantly written, delightfully told. I think this is a book that I would like to read again sometime. If Mom and Dad were in a debate and the subject was grades, Mom would say that what you actually learn is more important than the grades you get. Dad would argue that grades are an indication of what you’ve learned and how you handle responsibility. If I had to choose sides I’d choose Mom’s. Jeremy Dragon came back for a second brownie, then a third. Alison handed him the brownies and I took his money. That way we each got to touch him three times. I looked at her and we both laughed. Then Rachel walked me home. We managed to walk each other home nine times before Mom called me inside. ‘Here’s to you, Rachel Robinson’ is the sequel to ‘Just As Long As We’re Together’. It continues the story from Rachel’s point of view and most of the characters who were there in the earlier book make an appearance here. But because the point of view has changed, the story looks different. Some of the characters appear to be different when compared to how they we imagined them to be after reading the earlier book. We realize that Rachel is not as perfect as it seemed earlier. She has her own problems, her brother Charlie seems to be a problem kid and has just been expelled from school and her sister has issues of her own. Her parents have issues of their own, though her mom is promoted to become a judge. Though I liked this book, I felt that the story and the characters had lost their sheen in this book. I also felt that though the author had given a glimpse into Charlie’s character, it is just a tantalizing glimpse. I would have loved to read more about Charlie, because Charlie is interesting, rebellious and wise. However, I enjoyed reading this book, nevertheless. I took my flute out of its case, sat at my music stand and began to play a Handel sonata. Music takes me someplace else. To a world where I feel safe and happy. Sometimes I make mistakes but I can fix them. Sometimes I don’t get exactly the sound I want, but I can find it if I keep trying. With music it’s up to me. With music I’m in control. Mom isn’t beautiful like Alison’s mother but she is very put together. She wears classic clothes and her hair is always perfect, whether it’s loose or tied back. She says grooming is more important than looks. I hope that’s true because when Mom was young she was awkward – too tall like me – and had a serious case of acne, like Jess. Have you read any of these books? What do you think about them? I discovered ‘Are You There, God? It’s Me, Margaret’ by Judy Blume through fellow book bloggers. 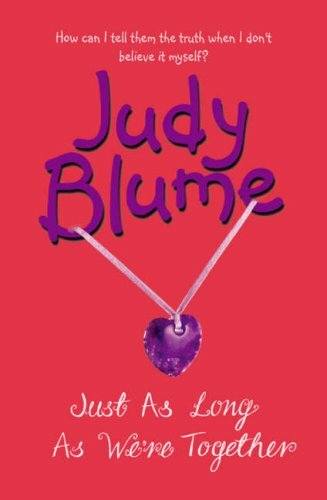 I had never heard of Judy Blume before and most of the bloggers who wrote about it said that this book influenced them in important ways when they were growing up. Later, while browsing at bookstores, I started seeing Judy Blume books. They seemed to be written for children – not the YA variety but for children – and I rarely buy children’s books, except during those once in a while times, when I really go and splurge on children’s books and read children’s literature for whole months. So, though I made a mental note of Judy Blume, I never read any of her books. A few days back, after taking a long walk in the evening, which ends at a place near a bookstore (not good for me! ), I decided to stop by at the bookstore and just browse around. I somehow ended up at the children’s section and there were rows and rows of Judy Blume books. I looked through some of them and decided to get one and it was ‘Are You There, God? It’s Me, Margaret’. I finished reading it in one sitting. Here is what I think. ‘Are you There, God? It’s Me, Margaret’ is about ten-year old Margaret who moves to a new school when her family moves from New York to New Jersey. The story is about the new friends she makes, the new experiences she has, the perceptions and prejudices that float around at her school, about the boys she meets and about her experiences with religion. It is a story of growing up. It is also about the changes – biological, mental, emotional, behavioural – and transformations, the eccentricities and the peer pressure that growing up entails. It is a book written for children, especially girls, but which adults can relate to. I liked all the characters in the book – there are no heroines and heroes and villains, only normal, lovable, imperfect people. I liked the characters of Margaret’s parents (Margaret’s father was born Jewish and her mother was born Christian and so her mother’s parents disown them when they get married), especially Margaret’s mother, who is really like a friend to Margaret. One of my favourite characters was Margaret’s grandma (her father’s mother), Sylvia Simon. She is cool and she rocks! I like the way Margaret’s parents try to not push her into any religion, but let her grow up and have different experiences before she decides whether she wants to believe in a specific religion or not. It is a beautiful concept, but I haven’t seen any parents practise it, because it is complicated. I also liked Margaret’s teacher Mr.Benedict, who is a nice and shy teacher, teaching his first year in school. One of my favourite scenes was when the naughty class of students plays a trick on him, but Mr.Benedict is patient and wins the game. I also liked a character called Laura Danker who is Margaret’s classmate and who is tall and looks grown-up and who is avoided by the rest of her classmates. I remember having a classmate like that when I was in primary school. She was called Tasneem and she was tall and she looked like a grown-up and no one in the class talked to her. Those days, we had classes only in the mornings till lunch time. But sometimes we had extra classes in the afternoons too. One day I came to the school in the afternoon and discovered that there were no classes. Tasneem had come too. We spoke for a while and we played a few games and I discovered that she was a really nice and pleasant girl. I didn’t know why I didn’t talk to her before and I didn’t know why the others in the class kept away from her. I also liked the scenes where Margaret goes to a Jewish temple and then to a Presbyterian church and then to a Catholic church to find out how the experience is. During this time I talked to Nancy every night. My father wanted to know why we had to phone each other so often when we were together in school all day. ‘What can you possibly have to discuss after only three hours?’ he asked. I didn’t even try to explain. Lots of times we did our maths homework over the phone. When we were done, Nancy called Gretchen to check answers and I called Janie. I think I will ask my sister to read this book, when she is in town the next time. I think she will like it and will be able to identify with the story and the characters. I wish there were books like this for boys – most books for boys seem to be about adventures and don’t depict everyday life. I think I must be the last person to read ‘Are You There, God? It’s Me, Margaret’. But in case you haven’t read it yet, and you think it looks interesting, I would recommend that you give it a try. It is a good book to gift to your daughter(s) or your niece(s) or your friend’s daughter(s) who are in their pre-teens or in their early-teens. 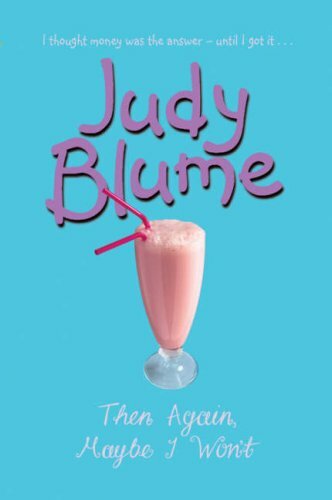 If you are a Judy Blume fan, I have a question for you. 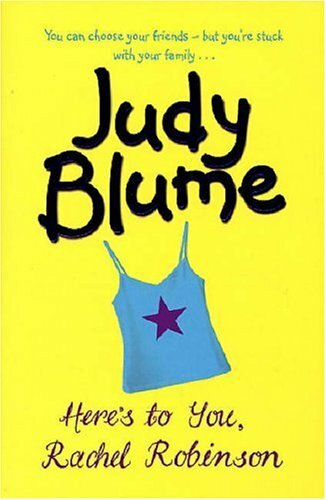 Which Judy Blume book(s) would you recommend that I read next?